RTÉ Radio 1 has announced the winning short stories for one of Ireland’s most significant literary prizes, the RTÉ Radio 1 Short Story Competition in honour of Francis MacManus. The shortlisted stories will be read on RTÉ Radio 1, from Monday 17th September. 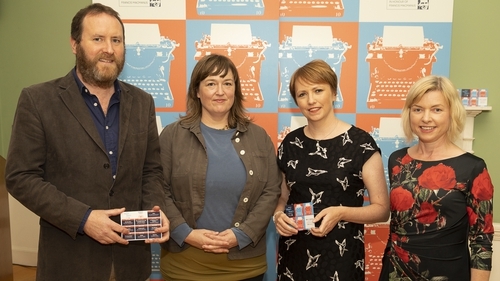 Judging the entries this year, which received a record number of entries (almost 1800), out of which a shortlist of 10 was chosen, were author and former finalist, Danielle McLaughlin, RTÉ’s Arts and Media correspondent and author Sinéad Crowley, and book publicist Cormac Kinsella. Claire Zwaartman, living in West Cork, takes home first prize with her short story Ashes. Claire started writing fiction a year ago when she began a Masters in Creative Writing in UCC. Ashes is the story of a pair of siblings scattering their father’s ashes. It is about the complicated nature of family, disharmony and moving on. Ashes will be read on air by Andrew Bennett. At the awards announcement, judge Cormac Kinsella said "What impressed me most about Ashes was despite its length the reader is given a fully realised world that the characters inhabit. I finished the story knowing them so well and the lives that they lived. It’s an economy and precision of language that is very rare to read." Peter McNamara’s The New Place claims second prize. Peter, who is from Dublin, works as a community journalist with a local newspaper and over the last few years has drafted several novels. Having just started writing short stories this year, Peter’s The New Place tells the story of Phil and his mother, which will be read on air by Peter Coonan. Phil’s mam has just moved out of the family home and in this short story, Phil is visiting her in her new flat, and trying to figure out how he feels. "Initially, The New Place appears to be a traditional Irish family story, but it soon becomes clear that there is another layer waiting to be uncovered," commented judge Sinead Crowley. "Deceptively simple, with well drawn characters and evocative writing, this story worked particularly well in the radio format and is sure to draw listeners in and keep them engaged until the deeply satisfying conclusion". In third place is Claire Mulligan from Monaghan with her short story, Have you Seen Her Legs? and Other Stories From Fat Land. In the past, Claire has contributed to RTÉ Radio 1's Sunday Miscellany and has had children's stories published in The Caterpillar Magazine. She has recently written her first children's novel. Claire’s short story, she says, is ‘the story equivalent of death by a thousand cuts’. Each vignette gives a glimpse into a moment in a girl's life where thoughtless words about her body leave marks that cannot be removed. Of this story, which will be read on air by Janet Moran, judge Danielle McLaughlin commented: ‘Every time I heard it something new came out through. It's full of lovely little touches and very intimate. The author has skillfully harnessed the intimacy that’s possible in radio between the broadcast and the listener. It’s a story that doesn’t shy away from its material in any way and at the same time remains nuanced, with lots of subtle layers’. The RTÉ Radio 1 Short Story Competition has been a critically important launch pad for new and emerging writers such as Claire Keegan, Anthony Glavin, Nuala O’Connor and Molly McCloskey, since its inception in 1986. The winning three stories will be broadcast on RTÉ Radio 1 from Monday September 17th on the Book on One (weeknights 11.20pm), with the seven shortlisted entries following over two weeks. You can also listen to and read the winning stories on RTÉ Culture in the coming weeks.